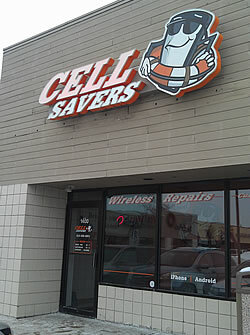 We’re located on the north end of Brighton, MI at 8200 Grand River Road, 48114. Feel free to stop in and check out our studio lobby to truly see what we can offer you or your business and the type of quality we maintain. Our efficient staff has over 10 years sign experience and over 16 years graphic & promotional design experience. Because we have such a talented crew with a core background in design, we can offer high end signage and graphics that go above and beyond the competition and make your business stand alone. We offer several graphic design services to help suit all your graphics needs. Please ask about our graphic design services anytime! We also have a strong customer service background, and truly listen to your needs and try to offer you the best products for you or your business. It’s about what works for you, and how we can help represent you or your business the best! But don’t take our word for it, our work speaks for itself! Simply checkout our large, online galleries, become a fan on Facebook or stop in to see us! Looking for a unique school fundraiser, the Canton Lions Junior Football Club approached W4 Signs about creating banners for each of the athletes. They had tried the multitude of school fundraisers — candy, apparel, toys, knick-knacks — and needed a fresh approach. 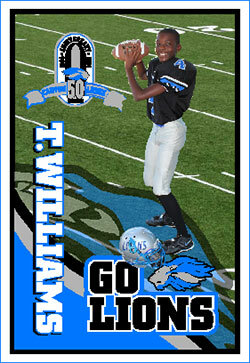 Our sign design team went to work and proposed individualized, sports banners featuring each athlete and cheerleader. While reviewing the sign project, there were two elements that resonated with the W4 Signs design team: personalized and memorabilia. Using our digital sign printing technology, it's cost effective to make individualized banners featuring the student's picture, student's name, team name and school logo. The larger size banners look great on the field and at home hanging in each child's room. As a fundraiser, the banners targeted the thing parents want most — memorabilia to celebrate the event and remind them of the school or club activity. Nothing celebrates an event more than seeing your child in their sport uniform. Combine the athlete's picture with familiar school and club logos, and you have unforgettable, personalized memorabilia. The Canton Lions Junior Football Club fundraiser was a huge success. Here is a detailed review of their banner project. If your school or athletic club is interested in a fresh approach to fundraising, W4 Signs is ready to work with you. Our professional designers can create banners similar to this case study for your school fundraiser or propose another digital printing solution for your fundraising needs. Call us today at 810-588-4703. Lucky's Diesel Shop is a Longmont, Colorado, business that specializes in repairing and enhancing Ford Powerstroke trucks. A long- standing member of the Longmont business community, Lucky's Diesel Shop relied primarily on their excellent reputation to attract new customers. Knowing they needed to enhance their marketing efforts, the owner, Sean Cash, approached W4 Signs about helping him rebrand Lucky's Diesel Shop. Like many projects, the rebranding started small with a logo and has moved into mobile advertising and business documents. Below is a detailed view of their story. Below is a brief description of the services we provided Lucky’s Diesel Shop. 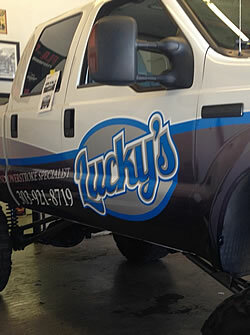 Above is an example of the original artwork produced for Lucky's Diesel Shop brand make-over. When your business needs a fresh start, W4 Signs is ready to work with you. Put our professional design and installation team to work on your project by calling 810-588-4703. View Additional Case Studies Here.